Having kids means you will hear a lot of funny and often embarassing questions being asked. My son recently asked me I take my breasts off at night. It turns out he actually meant my bra, but it made for a pretty funny 10 minutes. Yesterday he asked the new girl who helps us with the cleaning if she has a job. I immediately went in for damage control because I had a feeling where this was going. I explained that what she was doing was her job. So he answered he meant a real job, in front of a computer. I told him there are many jobs and only a small part entail sitting in front of a computer. I reminded him of our book that tells us about all the different jobs that people have, and how important each and every job is to make the world go around. She added that she has a computer but she is lucky enough to be able to use it to play instead of work. Then, later, when we were at the supermarket at the cured meats and cheese counter, after listening to the girl who was serving us complain that she practically lives in the supermaket because she has been working so much lately, he asked her where she slept. On the floor or on the crushed ice of the fish counter (maybe he thought it was the coolest spot in the supermarket). Recently we bumped into the father of a classmate of his and he asked him if he was her grandfather. On the other hand, my kids never embarass me when it comes to food. Whether we are invited somewhere or in a restaurant, they eat pretty much everything they are served. I can experiment any new recipe and they will usually eat it without a problem. Of course there are things they are not crazy about, but they are not many and if they have to they will eat them. When it comes to my husband, there is really only one thing he doesn't like: raisins. 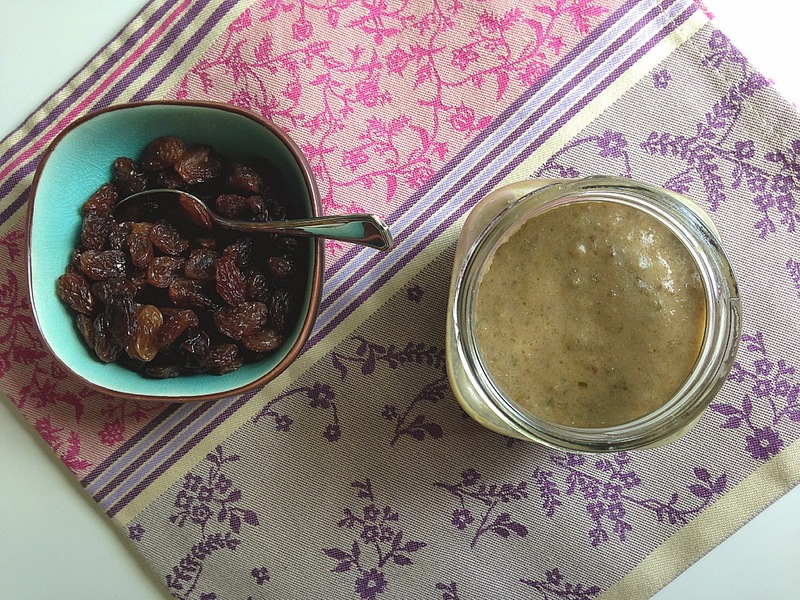 So even if this simple, yet very tasty sauce made with capers and raisins had caught my eye on Lorraine's blog a while ago, I had to wait till his soccer night to try making it. I set off with the idea of exactly replicating it but ended up making some changes and came up with a pretty different sauce altogether. Very good, if not promising in looks. The first change I made was to fry the garlic slivers until golden brown because something about the idea of raw garlic simmering in water put me off. I then set aside the garlic-infused olive oil and blended it with the other ingredients instead of using plain olive oil as indicated. My last variation was to add anchovies. I felt the sauce could use a little extra savory punch and that the anchovies would nicely balance out the sweet and sour. Lorraine's sauce was definitely more appealing to the eye, with its bright green and reddish brown flecks, but this one's flavor was good enough for me to insist you try it before I find a way to make it look more stylish! 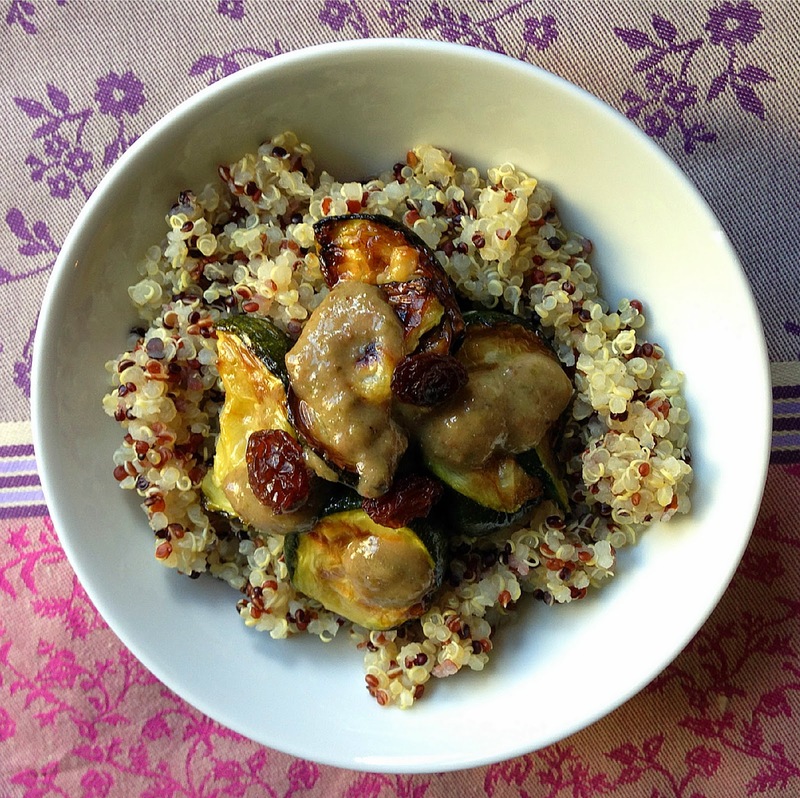 We had the sauce with roasted zucchini, raisins and quinoa. Since we had some leftovers I ended up drizzling some on red peppers as an appetizer a few evenings later and husband grabbed one before I could warn him. Once he was chewing I didn't have the heart to tell him... but he really seemd to like it. Surprise honey! Pour the olive oil into a small saucepan and when it is hot, fry the garlic slices until golden brown. Set aside the garlic infused olive oil for later, leaving the garlic in the saucepan. Add in a cup of water, the previously rinsed capers and the raisins and bring to a low simmer for about 15 minutes (add some water if it gets completely absorbed). 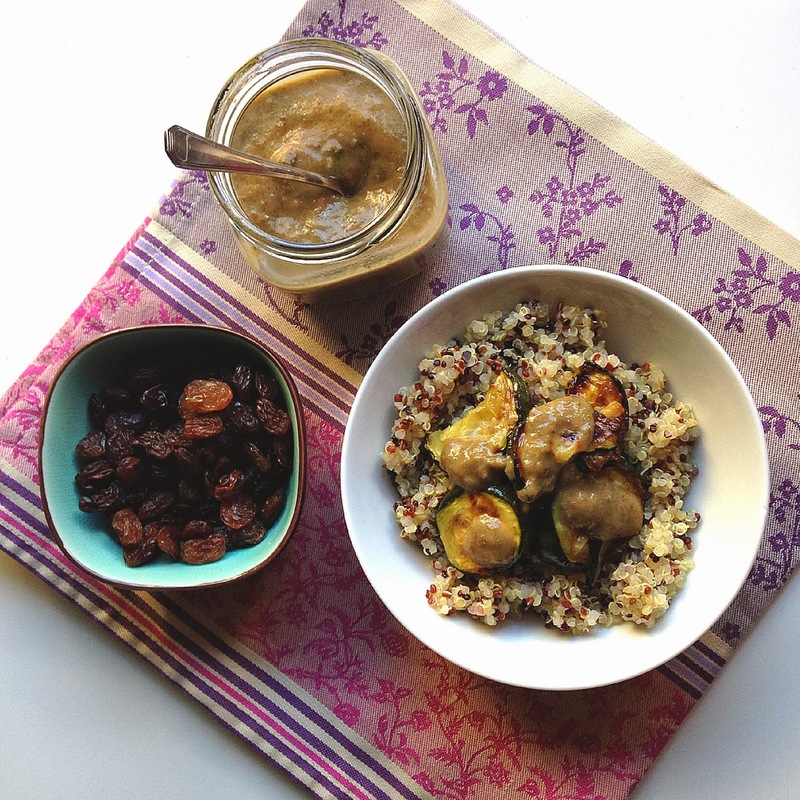 When the raisins have plumped up nicely, transfer the ingredients to a blender. Add the garlic infused olive oil, the vinegar (I added it a tbsp at a time because I wanted to make sure the vinegar in the capers wasn't too strong), the anchovy filets. Blend until it is smooth. Taste and add salt or vinegar if needed. You can serve this on roasted vegetables or with raw vegetables as a dip, or any other idea that tickles your fancy. Shallots sound like an interesting option too... I do love shallots! Questa me la segno! Sounds delicious! I love the questions your son asks. When kids ask these embarrassing questions, though, don't they always somehow make sense? And yay for happy eaters, although mine is m husband, not my younger son. I also love stirring and melting anchovies into sauces. They do add a punch but without being overly salty or fishy. This sauce sounds delicious!